We Offer Financing Options For Your Convenience! This is a beginning Shielded Metal Arc Welding course designed for the student who has little-to-no experience in welding, or who has had a long absence from welding. This is an intermediate to advanced Shielded Metal Arc Welding course designed for the student who has completed Level 1 SMAW Welding or has some experience in welding. The emphasis will be on preparation to pass the LADBS Vertical (3G) performance welding test. This is an intermediate to advanced Shielded Metal Arc Welding course designed for the student who has completed Level 2 SMAW Welding or has some experience in welding. The emphasis will be on preparation to pass the LADBS Overhead (4G) performance welding test. This is an intermediate to advanced Shielded Metal Arc Welding course designed for the student who has completed Level 1 SMAW Sheet Steel Welding or has some experience in welding. The emphasis will be on preparation to pass the LADBS D1.3 - Structural Welding Code - Sheet Steel examination. This is an intermediate to advanced Shielded Metal Arc Welding course designed for the student who has completed Level 2 SMAW Sheet Steel Welding or has some experience in welding. The emphasis will be on preparation to pass the LADBS D1.3 - Structural Welding Code - Sheet Steel examination. This practice session is designed for the welder who is advanced, and is ready to take a practical plate test, however would like additional time prior to an upcoming performance test date. Welding electrodes and practice material included in session fee. This practice session is designed for the welder who is advanced, and is ready to take a practical plate test, however would like additional time prior to an upcoming performance test date. Welding electrodes and one cruciform included in session fee. 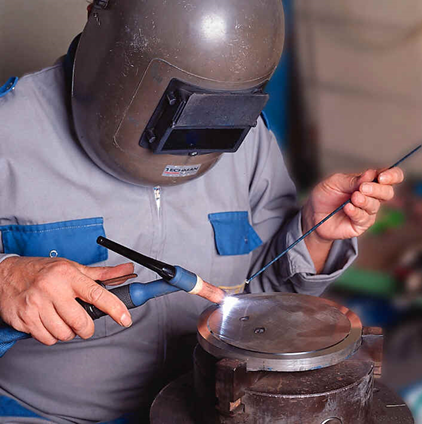 This is a beginning Flux Cored Arc Welding course designed for the student who has little-to-no experience welding with Flux Cored Wire used for structural applications. This is an intermediate to advanced Flux Cored Arc Welding course designed for the student who has completed Level 1 FCAW Welding or has some experience in welding. The emphasis will be on preparation to pass the LADBS Vertical (3G) performance welding test. This is an intermediate to advanced Flux Cored Arc Welding course designed for the student who has completed Level 2 FCAW Welding or has some experience in welding. 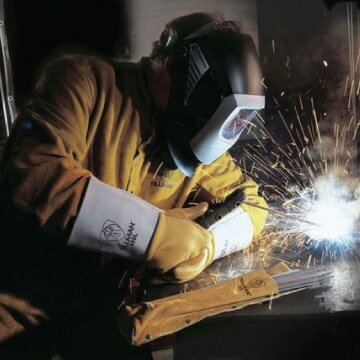 The emphasis will be on preparation to pass the LADBS Overhead (4G) performance welding test. 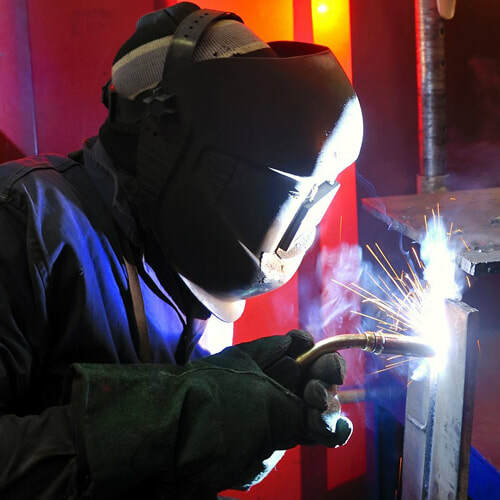 This is an Advanced Flux Cored Arc Welding course designed for the student who has completed Level 3 FCAW Welding or has extensive experience in Flux Cored Arc Welding. The emphasis will be on training the student to pass a Welding Certification performance exam and having the student do so. This is a Beginning Gas Tungsten Arc Welding course designed for the student who has little-to-no experience welding with the Gas Tungsten Arc Welding process on mild steel. This is an Intermediate to Advanced Gas Tungsten Arc Welding course designed for the student who has completed Level 1 GTAW Welding or has some experience in TIG welding. This class will build on skills learned by teaching out of position welding on mild steel. This is an Intermediate to Advanced Gas Tungsten Arc Welding course designed for the student who has completed Level 2 GTAW Welding or has extensive experience in TIG welding. The emphasis will be on learning how to TIG weld mild steel out of position. This is an Intermediate to Advanced Gas Tungsten Arc Welding course designed for the student who has completed Level 1 GTAW Welding or has some experience in TIG welding. This class will build on skills learned by teaching out of position welding on aluminum. This is an Intermediate to Advanced Gas Tungsten Arc Welding course designed for the student who has completed Level 2 GTAW Welding or has extensive experience in TIG welding. The emphasis will be on learning how to TIG weld Aluminum out of position. This is a Beginning Gas Tungsten Arc Welding course designed for the student who has little-to-no experience welding with the Gas Tungsten Arc Welding process on stainless steel. This is an Intermediate to Advanced Gas Tungsten Arc Welding course designed for the student who has completed Level 1 GTAW Welding or has some experience in TIG welding. This class will build on skills learned by teaching out of position welding on stainless steel. This is an Intermediate to Advanced Gas Tungsten Arc Welding course designed for the student who has completed Level 2 GTAW Welding or has extensive experience in TIG welding. The emphasis will be on learning how to TIG weld stainless steel out of position. This is an Advanced Gas Tungsten Arc Welding course designed for the student who has completed at least Level 2 GTAW Welding or has extensive experience in TIG welding. The emphasis will be on training the student to pass a Welding Certification performance exam. This is a Beginning Gas Metal Arc Welding workshop designed for the student who has little-to-no experience welding with the Gas Metal Arc Welding process on low-carbon, sheet, steel. This is an Beginning to Intermediate Gas Metal Arc Welding workshop designed for the student who has completed Level 1 GMAW Welding or has some experience in MIG. This class will build on skills learned by teaching out of position welding on mild sheet steel. This is an Advanced Gas Metal Arc Welding workshop designed for the student who has completed the Level 2 Sheet Steel GMAW Welding Course or has extensive experience in MIG. This class is designed to prepare a student to pass an AWS or LADBS Structural or Sheet Steel Performance Certification Exam. This is a beginning Gas Metal Arc Welding workshop designed for the student who has little-to-no experience welding with the Gas Metal Arc Welding process on low-carbon, structural steel and wishes to gain experience welding on thicker material in the flat and horizontal positions. The emphasis will be on safety, machine settings, and developing proper technique. This is an intermediate to advanced Gas Metal Arc Welding workshop designed for the student who has completed Level 1 GMAW Mild Steel - Structural Welding or has some experience in welding. The emphasis will be on preparation to pass the AWS/LADBS Vertical (3G) performance welding test. This is an advanced Gas Metal Arc Welding workshop designed for the student who has completed Level 2 GMAW Mild Steel - Structural Welding or has extensive experience MIG welding. This class is designed to prepare a student to pass an AWS/LADBS structural steel performance welding test. This workshop is designed to introduce the student to the safe operation and use of oxyacetylene equipment for the purpose of cutting mild steel. 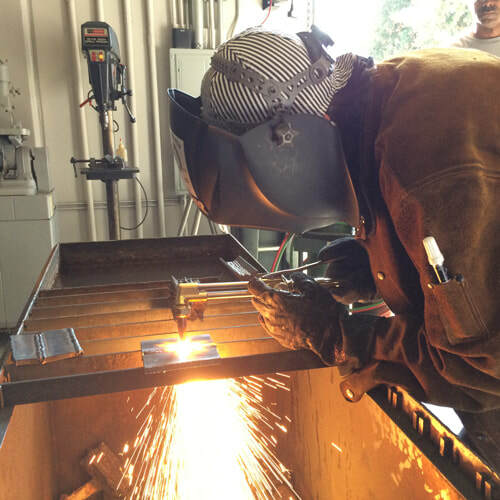 Knowledge of the oxyacetylene cutting process and procedures involved is a topic tested on the LADBS Department (Written) Exam, as well as the California State Contractors Board Exams involving welding. This workshop is designed for the welder who is interested in knowing the why and how of welding. It covers basic arc welding theory, electricity, welding power sources, CC/CV, processes, modes of transfer, polarity, welding discontinuities and defects, welding technique, weld joints, positions, metallurgy, visual inspection, and more. This workshop is designed to introduce the student to the standard symbols for welding, as presented in the AWS A2.4:2012 standard. Students will be able to read, interpret and understand, basic symbols with an emphasis on assisting them in passing the LADBS Department Written Exam. 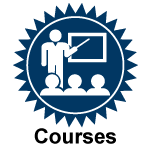 This program is designed to assist welders who have qualified according to the standards set forth by the AWS concerning Periods of Effectiveness for Certified Welders to keep a record of their continuity so as to prevent their certification from expiring.